The separation between infrastructure managers and transport operations is one of the basic principles of European railway regulations. The relationship between railway undertakings and infrastructure managers is based, among other considerations, on the payment of a charge for the use of the infrastructure. 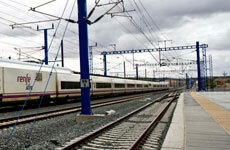 The recast of the first railway package (Directive 2012/34/EU) states that “the charges for the minimum access package and for access to infrastructure connecting service facilities shall be set at the cost that is directly incurred as a result of operating the train service” (Article 31.3). This is what is known as the direct cost principle, whereby the infrastructure manager will apply a charge so that, if an additional train passes, the charge paid by the latter will allow no losses to occur. The current formulation of the charge is based on different parameters, among which are the number of trains-km, speeds or train types. To enable the establishment of these charges, infrastructure managers need to have a comprehensive understanding of all the elements that determine the cost of operating the infrastructure. Amongst them, maintenance costs caused by normal operation of train services might be considered. The purpose of this presentation is to discuss a model that could be used to improve the implementation of the direct cost principle, in terms of maintenance costs. Firstly, the formulation of the fees is analysed, using the Spanish case as an example. A brief overview of railway maintenance and asset management is given below. Different studies are then considered on the relationship between tear and wear, as well as the costs of railway maintenance. Finally, a proposal is made for a new methodology.